So after a long day of adventuring, what better to do than tuck into a big juicy burger? Luckily, you’re spoilt for choice when it comes to finding a quality burger in Queenstown. So to save you looking, we’ve put together a list of our favourite 7 burger joints in Queenstown. Fergburger was established back in 2001 as a ‘hole in the wall’ burger joint and has since transformed into one of Queenstown’s best known restaurants. They offer a wide range of burgers, from the standard chicken and beef classics to the quirky and adventurous. With burgers such as the ‘Sweet Bambi’ deer burger and the ‘Bun Laden’ falafel, their menu appeals to a wide range of tastebuds. Come armed with a sense of humour and a large appetite. With a name like that you’d expect to get something truly decadent at Devil Burger, and you’re not going to be disappointed. There’s a huge range of burgers on offer, including beef, chicken, lamb, venison and vegetarian options, however our top pick is the ‘Old Harry’ – a fresh NZ Blue Cod fried in crispy beer batter, served with devil's homemade tartare sauce and salad. The prices are reasonable, starting at just $9.50 for the standard ‘Devil Burger’. The aim of the game with Flame Bar & Grill is to build your own burger. You’ll start with the base (beef, chicken, veggie or ‘Boerewors Roll’ which is basically a hot dog that uses a gourmet African sausage as its base), and then you’ll add whatever ingredients you desire. Topping choices include beetroot, pineapple, black field mushrooms, crispy onions, fried egg, streaky bacon, onion jam, South African chutney and blue, edam or halloumi cheese. Whatever your poison, Flame Bar & Grill has you covered, and its deluxe ingredients ensure the flavour is top-notch. The Atlas Beer Café at Steamer Wharf is the ultimate place to sample Queenstown’s best craft beers. With 22 varieties on tap, any beer fan in the world will want to spend some serious time here, and what food goes better with a good local brew than a juicy burger? There might not be too many options – you’ve got a choice between a beef burger with mac and cheese hash, bacon and smoked tomato sauce, or a chicken burger with peanut satay, cucumber and shallots – but this is a story of quality over quantity. These two burgers, accompanied with a cold pint of beer, makes for one of the best food experiences in Queenstown. Situated right on the spectacular Steamer Wharf, Pier 19 blends a mix of modern and classic flavours to deliver a unique Queenstown dining experience – and they certainly know how to serve up a quality burger. Their Zamora beef burger uses all the classic ingredients, including aged beef, rocket, cheddar, tomato and beetroot, combined to pack a serious flavour punch. Joe’s Garage offers the best in laid-back Queenstown dining, with a great selection of burgers to boot. Located at Searle Lane, the restaurant takes pride in being a friendly environment where people are welcome to bring their pets, kick back, and enjoy great food in a relaxed atmosphere. Our pick is the chicken burger – served with streaky bacon, swiss cheese, caramelised onions, tomato, lettuce and aioli with chips, you really can’t go wrong. Joe’s Garage is the perfect place to fuel up before a day of skiing, their coffee is top quality too! It’s easy to overlook Winnies when you’re on the hunt for a burger. It is, after all, best known for its gourmet pizza. However don’t let the Italian label fool you, as Winnies serves up one heck of a burger as well. With three gourmet burgers on offer – The Winnies Beef Burger, Mexican Chicken Burger and Lamb Burger – it’s a tough pick. Whatever you choose, make sure to accompany it with the restaurant’s famous beer fries. 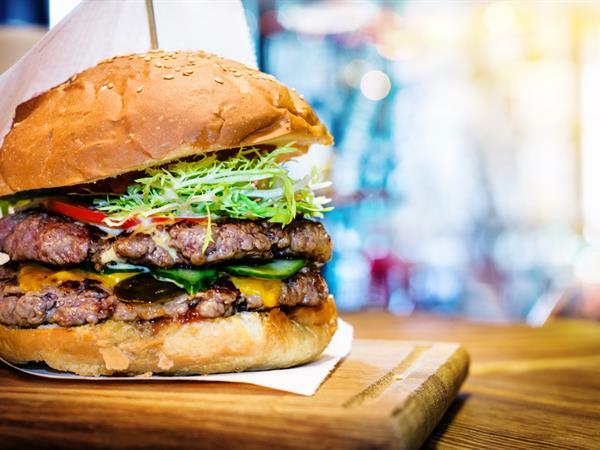 Whether you’re on the hunt for a classic beef burger or would rather something with a gourmet touch, Queenstown has all of your burger cravings covered. So if you’re heading to Queenstown, make sure to check out one (or more!) of the burger joints on this list, they sure won’t disappoint!